Fiction – paperback; Vintage; 224 pages; 1996. Translated from the German by Brian Murdoch. 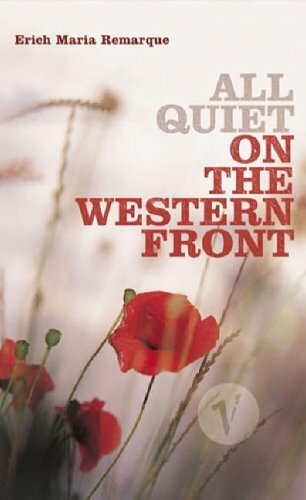 Described as the classic anti-war novel, All Quiet on the Western Front is a devastatingly emotional read about German soldiers fighting in the Great War. Told through the eyes of 19-year-old soldier Paul Baumer, it details his experiences fighting in the Flanders’ trenches. silently, uncomprehendingly, foolishly, obediently and innocently killing one another. I see the best brains in the world inventing weapons and words to make the whole process that much more sophisticated and long-lasting. And watching this with me are all my contemporaries, here and on the other side, all over the world – my whole generation is experiencing this with me. What would our fathers do if one day we rose up and confronted them, and called them to account? What do they expect from us when a time comes in which there is no more war? For years our occupation has been killing – that was the first experience we had. Our knowledge of life is limited to death. What will happen afterwards? And what can possibly become of us? The beauty of this book is that this is essentially a first person account of life on the frontline based on Remarque’s own wartime experiences. There are no heroics. No homage to the glories of war. Instead we read about the soldiers’ all abiding desire to avoid death, to cling on to life for however long it is possible to do so, amid the muddy, bloody, corpse-strewn battlefields of the Western Front. Similarly, the story has little historical detail and no political insight. If you did not know that Baumer was German, you could easily mistake the soldiers as being British or French or Australian. This subtle message is perhaps Remarque’s greatest gift: All Quiet on the Western Front shows that all men are equal when it comes to war. Despite being written in 1929, its message still resonates today. I found this book to be an incredibly sad, lump-in-the-throat read but one that is powerful and life-changing. If you haven’t read it, then you must. I’m *so* pleased that you found it as powerful of a read as I did. And I’m so happy that you persevered with it. When you posted a while back just how upset the book was making you, I was afraid that you would stop reading it. It is really one of my all-time favourite books and I am glad that there are more people out there that find it as powerful as I do. I read it when I was in high school (I was 16) and it have re-read it a few times since. Still rings true every single time. If you’d like to pursue the WWI theme and the damage it did to young men on both sides, I’d recomment Pat Barker’s Regeneration trilogy. It focuses on the British side, but it is very good. You might want to read something light before that, though. Kinuk, one of the more powerful books I’ve ever read and am so glad you recommended it to me. I have read the last of the Barker Regeneration trilogy – I never got around to reading the first two. I have no idea why I read the last one first, I think I probably picked it up cheap many years ago. I can recommend an Australian book with a WWI theme, if you’re interested: “1915” by Roger MacDonald, published by University of Queensland Press. It’s out of print and hard to track down, but definitely worth a read if you can find it.